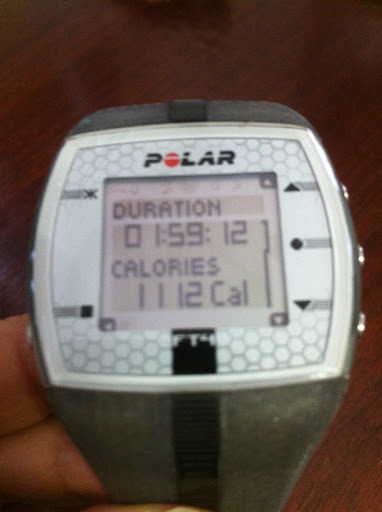 You heard me gush about doing ten miles in under two hours last Thursday. This morning, I ran again with Kerry and Jenny, and we did five miles. That’s half the distance, so I expected it to be easy, but it wasn’t. This weekend, I rode the dam loop (45 miles of fairly rolling hills with two big climbs) on Saturday, and I ran 7 miles with Poppe and did a short hill workout on Sunday. Monday, I rested because my calves were sore, and I wanted to sleep in. This morning, I expected to wake up rested and fresh, but I didn’t. My legs were still sore, and I felt like I could sleep for hours more. Thankfully, Kerry called me to make sure I was up. She is consistent and helpful like that. And we ran. It was “only” five miles, but it was hard. I say “only” intentionally in quotes because I recognize my own skewed perspective when a solid five miles before work seems as though it is perhaps not enough. I felt a little guilty for running five, but I think it was wise of me not to stretch the morning out. I’m still tired from the weekend. The way I feel today reminds me that it is early in the training season. I’m way ahead of where I was in 2010 when I trained for Canada, so I need to appreciate the comfortable days and not worry about the hard ones. I’m confident my body will figure this whole thing out again. I’m hopeful my mind will too. This morning, I ran ten miles in just under two hours. I ran the 7 mile loop on Lady Bird Lake with Kerry and Jenny, and I followed that up with the 3 mile loop on my own. Back on February 12, I did the same run. Then it took me 2 hours and 5 minutes and felt really difficult most of the way. This morning, I was six minutes faster, and it felt easier. It wasn’t easy. I struggled, especially the first few miles, but it was easier. It felt like progress, and I like progress. After more than a year of no racing, I’m officially back into training mode. The Austin Marathon reminded me just how much I enjoy a finish line, so I’m planning this year’s races and setting this year’s goals. The big one will be Ironman Canada, which I’m really excited about largely because there will be a huge Austin contingent there, including some faces I consider friendly. Plus, I know the course really well. It’s one I’ve done before and spectated, not once but twice. Penticton, British Columbia, is a beautiful place, and Ironman Canada is fantastic race. I’m excited to go back this year as a competitor. I have missed having the focus of a big effort like Ironman. Last year, I had to deal with some work changes and other uncertainties that made focusing on something like Ironman difficult, so I stepped back a bit. I think that was necessary for that time, but it kept me from working through my issues the way I normally do. I consider heavy training to be one way of dealing with my internal demons. (That word is probably harsher than I intend, but you get the idea.) Cut the heavy training, and the stuff in my head continues to swim around, unaddressed and unresolved. My emotional well-being and my physical well-being are linked closely together. I don’t know if that’s true for everyone, but it’s true for me. If I’m heavy and out of shape, it’s a safe bet to say that I’m struggling with something in my head. If I’m struggling to get out of bed for workouts, that’s when I need the workout – and the clarity it brings – the most. Right now, I’m struggling. I’m the heaviest I’ve ever been, and getting to my workouts hasn’t been easy. But I have started these last few weeks to find my focus, and I’m slowly feeling the internal fog beginning to lift. I’m starting to get excited again. That, too, is progress.